Rhett Miller has spent much of his songwriting in tunnels. With The Traveler, he also has the sense to have light shine into them. Rhett Miller writes a lot of songs. Some of them go to his band the Old 97's. Some of them go to his solo albums. (Presumably some end up in the trash or somewhere -- I can't speak to that.) The most recent release from the Old 97's, Most Messed Up, was an aggressive, hedonistic burst take on an adventurous lifestyle. Those sorts of songs tend not to end up on Miller's solo records, and a separate set of songs came together for his latest release, The Traveler, his seventh record, and the first with Black Prairie as his backing band. Black Prairie, featuring some members you might know from the Decemberists, adds a more sweetly country feel to the music. Though there's no typcial bluegrass here, the flexible band's most cited genre, that background does come through. Annalisa Tornfelt (also of Bearfoot) provides smooth violin work throughout that heightens the pleasant feel of the record. “Pleasant” isn't meant to be faint praise; the music of The Traveler highly listenable, and at times as bouncy and exuberant as Miller gets on his albums. The new band fits in well with Miller's previous work, but the change feels invigorating and aptly sets the tone for this album's songwriting, even as a cut like “Kiss Me on the Fire Escape” would have fit in on either The Believer or his self-titled disc. 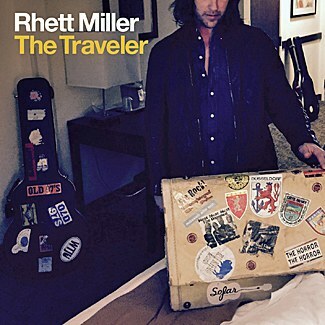 There is a trick to listening to Rhett Miller albums. No matter how enjoyable and energetic the album sounds, don't expect to wind up happy. The pop music and smart writing sometimes obscure the dark thoughts hidden throughout, and The Traveler provides a similar experience. The clues should be there early. Country rambling “Wanderlust” opens the album with relationship concerns: “Wanderlust will be the death of us”. Even a singer looking back can see what's coming. There's risk and loss, with disaster “just a little push” away. Miller doesn't stay in that place, though. Rollicking first single “Most in the Summertime” makes a listener glad that it's May and ready to fall in love. It's easy to miss Miller saying, “I lied and said that I'd be fine,” when the lovers depart at a Greyhound station, but the reunion feels imminent, and Miller sounds as hopeful as he does happy. The country waltz of “My Little Disaster” might be more reflective, but it's warm. He sings of his “lady of leisure” that she “might not have a mattress, but she has got me” even if “tomorrow I've got no idea where I'll be." In Miller's even-keeled delivery, there's a comfort in an unstable world. The song's final verse offers a quick thesis for the life of The Traveler: “Life is too short to say 'no' when you're asked / To share a shag rug or a pull on a flask.” There's an immediacy to the comforts presented here, not that they're permanent -- they aren't -- but they're valuable in a world of flux and movement. The dangers of that world become more apparent as the album progresses. The dark moodiness of “Dreams vs. Waking Life” makes me half expect Neil Gaiman's Sandman to appear in a cowboy hat (he already has the duster). “The waking life kills me,” Miller sings, but the somnial fantasy world doesn't inspire much hope. “Wicked Things” might offer perverse optimism in its twining of destiny and silence, but both nouns only provide a foundation for a life sentence. Fortunately, Miller doesn't leave us there. Sometimes a listening trick is just a trick, and Miller, who's chronicled depression and other problems in the past, can see a way through. Closing number “Reasons to Live” finds exactly what its title suggests. Miller sings, “Thank God I didn't die when I wanted to... I have found reasons to live.” The band builds climaxing joy into the chorus. If Miller has spent much of his songwriting in tunnels, he also has the sense to have light shine into them. This light colors subsequent listens. The Traveler, despite its name, isn't a journey somewhere, and certainly isn't one into darkness. There's more breadth than linearity in the album, and if there's a lack of destination -- which requires saying a reason to live isn't a worthy destination itself -- there is still a complexity of expanse, with the scope of experience being quite wide.